TOLEDO — Galion’s Garrett Kuns and Mason Weldon are headed to the state wrestling tournament this weekend in Columbus. They qualified during action in the Division III district tournament last weekend at Toledo Waite School. The Tigers sent six wrestlers to the district tournament. The state meet is at the Jerome Schottenstein Center on the campus of The Ohio State University. Weldon finished third at heavyweight with a third place finish. Kuns, wrestling at 170 pounds, finished fourth. The top four wrestlers in each division qualified for the state tournament. Kuns started his day with a first match loss to Noah Baker from Elmwood by decision, 5-4. But Kuns persevered. In his second match, Kuns faced-off against Blake Hohler of Edgerton won by pinfall at 4:00. Kuns’ third match was against Tyler Houston of Swanton. Kuns won 5-2. Tim Meyer from Tinora became Kuns’ third victory, this time by major decision, 16-4. Kuns went on to beat Trevor Mack from Northwood, 10-8 in the tie-breaker, earning his bid to the state meet. With a spot at the state meet secured, Kuns battled Mohawk’s Cole Draper for third place. Draper, a two-time state qualifier, defeated Kuns by major decision, 8-0 for third. Kuns settled for fourth, with a 4-2 mark. Weldon started off his day on a winning course, earning a victory in his opening round match with a 41-second pin over Ethan Brown from Edgerton. In his second matchy, Weldon faced CJ McCrimmon of Sandusky St.Mary Central Catholic. Weldon advanced with a pinfall in 4:44. In his third match, Weldon squared off against undefeated Derek Smith of Tinora. Smith would pin Weldon in 1:27, sending Mason to the other side of the bracket. Wes Bok of Fairview proved to be an easy match for Weldon as Mason won by pinfall in 0:42 to secure a spot at state. Weldon captured third place in the heavyweight class by defeating Thomas Lytle of Swanton by pinfall in 2:11. His record for the day was 4-1. 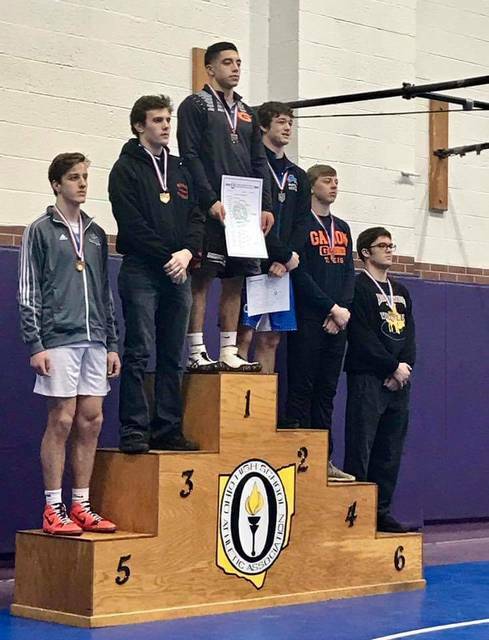 Other results for the Galion wrestling squad were: 106-pound qualifier Brenden Ganshorn lost by pinfall in the first round (1:19) and in the second round (2:25); 126-pound qualifier, Cody Brady lost by tech fall (16-1) in the first round and by pinfall in the second round (2:43); 160-pound qualifier Matt Oehrli lost by pinfall in opening round (3:36) and by major decision in second round (10-1); 195-pound qualifier Noah Grochowalski loss by decision in first round (8-4) and by pinfall in second round (2:18). The state wrestling tournament will begin on Thursday March 9 and run through Saturday March 11.